Loose Powder – should either be translucent or as close to the base color as possible. Eye Shadow – your will need 2 colors, Dark Brown and White. Both should be a matte formula so it gives the most impact. False Eyelashes – should again be either Black or Dark Brown and are applied with eyelash glue. Lashes are applied after you do your Eye Shadow and Liner. Lipstick – should be a rosy brown color. It should be natural looking. If it is too dark your lips will look black onstage. If it is too light your lips will disappear. Notice we are not saying Red. We want you to look natural. Additional Materials for your kit – you will need brushes, latex sponges or wedges, eyelash adhesive, small scissors, and eye shadow applicators, makeup removing cloths, Q-tips. Where to buy your make-up? The more costly the make-up the better the pigment used to make it. I prefer MAC, but ELF http://www.elfcosmetics.com makes great make up as well and you can buy it at Target or CVS. How to apply your make-up? Base/Foundation – Using a sponge or a foundation brush you want to apply a thin even coating to your face. You then use your sponge to blend down your neck so you don’t look like you are wearing a mask. Loose Powder – is applied carefully and minimally. It is used to set your base make-up and will make it less likely to smudge. Use a large brush to apply and to sweep off the excess. 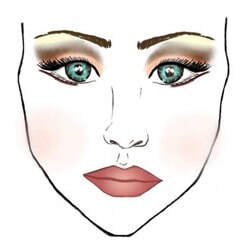 Cheek Color/Blush –using a blush brush or a wedge you are going to accent the cheek and the top of the cheek bone so you are above the contour. Eye Shadow – You are going to apply the White eye shadow to your eyelid and just below your eyebrow. The Brown eye shadow is applied to the crease of your eye and extends out to create the “wing” that your will later follow with your liner. Eyeliner – the liner follows the lid of the eye and extends out to follow the line of the brown shadow. You will then line below your eye and extend that line parallel to the top line leaving a slight gap in between that you will highlight with a bit of white eye shadow. False Eyelashes – apply as little glue as possible to the false lash. Starting at the inner corner of the eye place the lash as close to your natural lash line as possible. Tap the lash into place and let it dry. Repeat it on the other eye. Lipstick – fill in your lips with your lipstick. If you choose too glossy of a lipstick it may wear off faster, so choose accordingly. If you have followed all of the steps you are ready for the performance!